There’s nothing wrong with being shy. 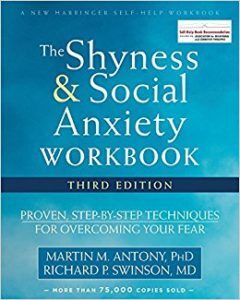 But if shyness or social anxiety keeps you from building meaningful relationships with others, advancing in your education or career, or simply living your best life, The Shyness and Social Anxiety Workbook offers a comprehensive program to help you confront your fears and become actively involved in the world. If you are shy or socially anxious, you may dread going to parties, speaking in front of crowds or people you don’t know, going to job interviews, and other critical life situations. You aren’t alone. In fact, studies show that millions of people suffer from a social anxiety disorder. Unfortunately, you can’t hide from some social situations—no matter how much you wish you could. But you don’t have to go on suffering silently. The good news is there are proven-effective techniques you can start using right away to help ease your anxiety or shyness and start living the life you were meant to live: a life where fear doesn’t get in the way of reaching your goals. This fully revised and updated third edition incorporates breakthrough new research and techniques for overcoming social phobia, including a new chapter on mindfulness-based treatments, updated information on medications, and an overview of treatment-enhancing technological advances. As you complete the activities in this workbook, you’ll learn to find your strengths and weaknesses using self-evaluation, explore and examine your fears, create a personalized plan for change, and put your plan into action through gentle and gradual exposure to the very social situations that cause you to feel uneasy. After completing this program, you’ll be well-equipped to make connections with the people around you. Soon, you’ll be on your way to enjoying all the benefits of being actively involved in the social world. If you’re ready to confront your fears to live an enjoyable, satisfying life, this new edition of The Shyness and Social Anxiety Workbook offers a comprehensive program to help you get started. What are you waiting for?